A couple of weeks ago I was meeting with a client to sign closing documents for his condominium purchase in the Scenic on Eglinton project in Toronto’s Leaside neighbourhood. Since the project address is on Brian Peck Cr., I asked “Winston” if he knew who Brian Peck was. It turns out that, although both of us are history buffs, we had no idea who the street was named after. But we both wanted to know the answer so, with Winston’s enthusiastic co-operation, we paused the signing process and began an Internet search to uncover the mystery of the man whose name graces the street signs. We quickly discovered that the name Brian Peck is associated with the old Leaside Aerodrome which was built by the Canadian government to train pilots, mechanics and crews for the Royal Flying Corps. Construction of the airfield began in May, 1917, on 220 acres between Wicksteed and Eglinton Aves. On June 24, 1918, Peck piloted a Curtis two-seater airplane from Montreal to the airfield on the outskirts of Toronto. He had on board the first bag of mail to be delivered by air in Canada. The flight left the Bois Franc Polo Grounds in Montreal at 10:12 a.m. Wind and rain buffeted the small plane which was forced to make refuelling stops at Kingston and Deseronto. Finally, at 4:55 p.m., Peck and mechanic C.W. Mathers landed at the Leaside Aerodrome, just south of the current intersection of Brentcliffe Rd. and Broadway Ave.
Today an Ontario Heritage Foundation plaque stands in a small parkette at that intersection to mark the delivery of Canada’s first airmail. The plaque notes that the flight had been arranged by a civilian organization, the Aerial League of the British Empire, to demonstrate that aviation was the way of the future. The Canadian post office co-operated in the mail delivery and each of the 120 letters on the inaugural flight bore a special cancellation to mark the occasion. The airfield was closed in 1931 but it is remembered by two local street names — Aerodome Cr., and Brian Peck Cr. 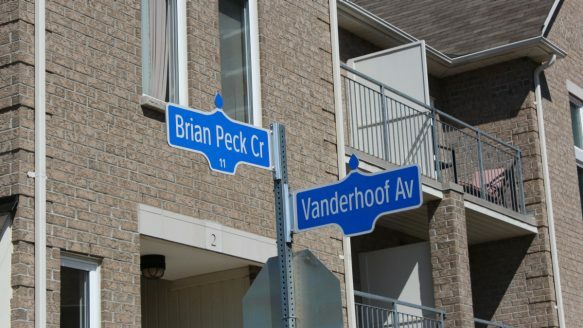 I contacted Bob Dixon, controller of Aspen Ridge Homes, to see if the developer of Scenic on Eglinton should get credit for the Brian Peck street name. He emailed to say that the name was inherited when the company purchased the land. Brian Hall, who works at the City of Toronto’s land and property surveys department, told me that when new streets are being created, research is done to find names that do not conflict with existing names, and are suitable to the area. The names should also meet the criteria of the street naming policy, which is posted on the city’s website. Street name suggestions can come from various sources such as city staff, historical groups, preservation panels, the ward councillor or the developer. Proposed names are then circulated to police, fire and EMS, the district preservation panel and the ward councillor for comment. The name Brian Peck Cr. was suggested by the East York Historical Society back in 2001. Toronto’s street naming policy is an excellent way to celebrate our rich heritage. Back in 1979, the city of Toronto held a competition for street names in the St. Lawrence neighbourhood housing development. The result was six streets named after local historical figures. Longboat Ave., was named after Thomas Longboat, an aboriginal champion long-distance runner. Albert Franck Place honours the famous Canadian artist, and Henry Lane Terrace was named after the architect who designed the Church of the Holy Trinity, parts of Osgoode Hall and the city’s second city hall which is now St. Lawrence Market. Another good example is the Martin Goodman Trail, named in memory of the former president and editor-in-chief of the Toronto Star who passed away in 1981. The trail is part of the 730-kilometre Waterfront Trail stretching from Niagara to Quebec along Lake Ontario and the St. Lawrence River. Sometimes the street-naming policy simply doesn’t work. The worst example, in my opinion, is Scarborough’s Mike Myers Dr., named after the lead actor in Wayne’s World, three Austin Powers films and the memorable (not!) So I Married An Axe Murderer. But kudos to those responsible for naming Aerodrome Cr. and Brian Peck Cr.